I would like to turn to the great masters of the fine arts to further explore the achievement of happiness: Maslow’s final level of his hierarchy of needs, Csikszentmihalyi’s forging a unity with universal values, and the ability of Campbell’s hero to go back and forth between the everyday world and the spiritual world. As I discussed in the previous post, Maslow, Csikszentmihalyi, and Campbell, the three modern thinkers presented in my book, teach that the fulfillment that is encountered upon reaching happiness is a completion of one’s destiny or mission in life. The life that is experienced by those in true happiness is one free from all fears and human desires, competitiveness, striving, fatigue, and personal ambitions. Let’s look at another master of the art world who depicts such a life of one who has achieved true happiness (has reached Maslow’s final level of the hierarchy, Csikszentmihalyi’s unity with universal values, and Campbell’s comfort with the everyday world as well as the spiritual world. Jules Perrot, the great dancer and ballet master of Europe, is teaching the class. The musicians have taken a break. All the girls are engaged in conversation, except one. That one girl is seen dancing for the master. She is in a state of ecstasy. 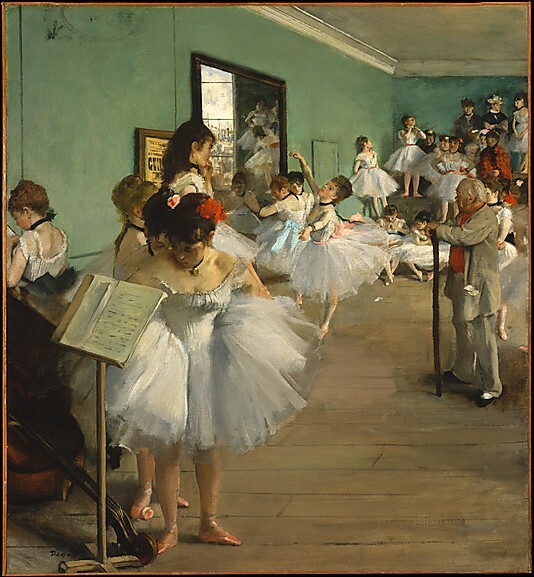 As she executes her pirouette, the viewer is uncertain as to the success of its execution; the tutu of the girl in the foreground hides the result. But the outcome does not matter; the master is seemingly enthralled by her enthusiasm and courage to come forward. As expressed in the Eakins painting in the previous post, the master is standing apart from the others in the scene. None of the other characters is looking at him. Perhaps he is alone in a spiritual world, to return soon to the everyday world of his class. He expresses autonomy, effortlessness, self-sufficiency, and a willingness to assist others. He exists in both worlds and, as a result of his mastery, has been able to bring the boon of teaching and instruction to others. This entry was posted in Uncategorized and tagged Abraham Maslow, Csikszentmihalyi, Degas, happiness, Joseph Campbell on April 11, 2014 by oliver.